Ah, HSC Business Studies. As you are reading this you probably just let out a deep sigh or mumbled ‘are you really serious’ to yourself. Well, I am serious! HSC Business Studies is perceived to be one of the driest and content heavy subjects that makes you want to cry when you look at the syllabus. However, within two years I came to LOVE Business Studies, with it being both my favourite and academically best subject. With two 100’s and a 98 in my internal assessments, I hope that this guide can help you approach Business Studies in a simple yet, effective manner. 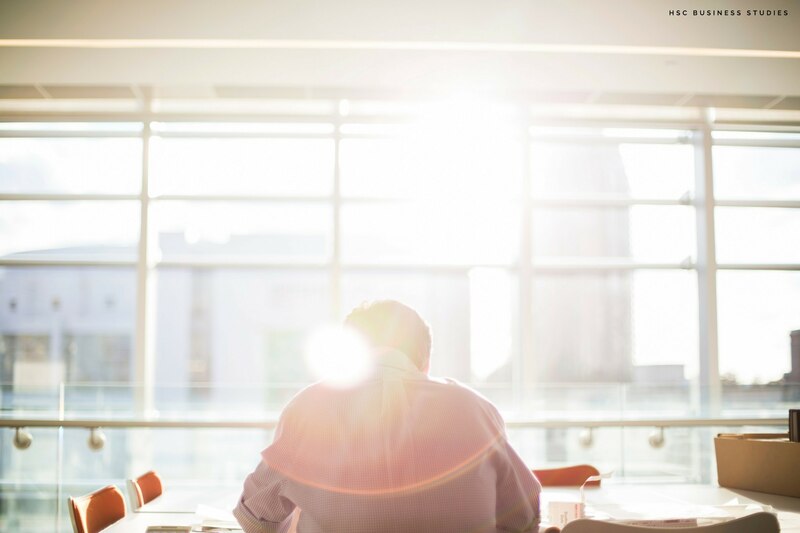 By the time you finish reading this article I hope you have gained an insight into why I love Business Studies, including a few of my own tips and tricks. Hopefully you will be able to know how to put your own spin on grasping this perceivably dreaded subject, especially those tougher topics *cough* Finance *cough*. MAKING THE SYLLABUS YOUR BEST FRIEND! Okay, so I am not going to sugar coat it. It doesn’t matter how scary or lengthy the syllabus looks, YOU NEED TO MAKE IT YOUR BEST FRIEND. I honestly cannot stress how important it is for this subject. You need to know the Business Studies syllabus inside and out. When I did my HSC this year it got to the point where I could basically recite the syllabus without looking at it, that’s how well I knew it. Not only does the syllabus outline what you should be studying, it is also a really effective tool for planning your extended responses. If you know your syllabus, your mind is able to quickly catalogue what dot points relate to the question, making it easier for you to plan the response under exam conditions. Whether you print it out on A3 paper and stick it on your wall, make flash cards, devise some acronyms or even make it your phone wallpaper, you just need to know it. Trust me on this one. 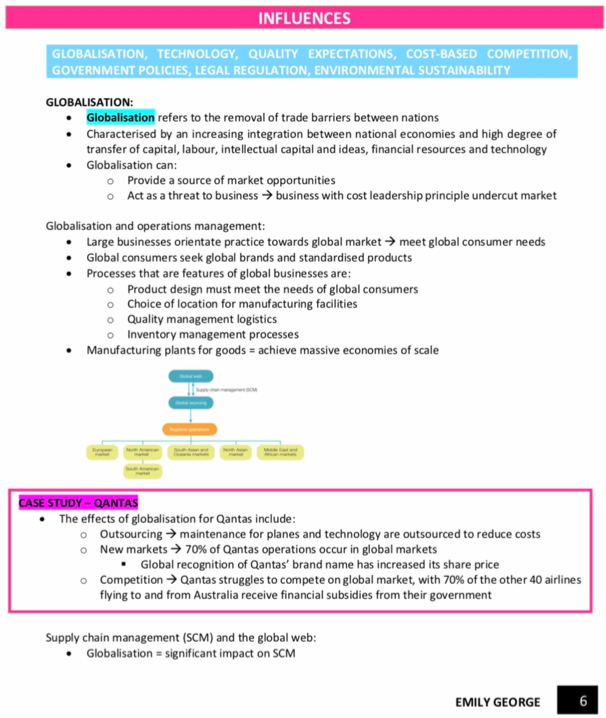 Question 26 – “Explain the influence of global markets on financial management of businesses”. So, my advice is to know these well and even write essays/plans for them if you can! An important factor to succeeding in Business Studies is having a set of simple and effective notes that are really easy for you to understand. When I wrote my notes for the HSC, I found the easiest way to do this was by following the syllabus, alongside the aid of my textbook. This way I could summarise the information in a few dot points under different headings, ensuring I had enough information that would allow me to answer a variety of questions with different mark allocations. Personally, I spent hours formulating the perfect set notes for me, which were both informative and aesthetic. You can see a page of what my notes looked like below. Now, you may think that having pages of notes is a great thing, but in reality, you probably have information that could be simplified or isn’t necessary. I remember my Economics teacher told me sometimes lengthy notes can do more harm than good because you constantly feel stressed that you have to memorise every bit of information in your notes. I HIGHLY recommend writing your notes in advance, this way when you’re going through the content in class, it isn’t the first time you have heard the information but rather your brain is consolidating it. Most of you are probably thinking should I have one or two or you’re freaking out because you have none. Your school would have probably prescribed a case study for you. My case study was Qantas but another common one is Apple. These case studies should be used in Section IV, where they’re integrated into your essay to highlight the success of the strategy the business implemented. ALWAYS HAVE STATISTICS. This allows you to make a ‘judgement based on a criteria’, which satisfies the top band of the marking criteria. Always do some wider reading to allow yourself to gain a competitive advantage. I always watched the news, listened to the radio and even made a Twitter account for all school related things. My notes probably contained over 20 different businesses that I used for case studies. If you’re ever in an exam and you don’t have a case study, just fake it till you make it. In saying that, make sure it is realistic. Your case studies are primarily used in Section IV but be careful. Recent trends have shown that short answer questions are requiring students to provide a ‘relevant example’, aka you need a case study. So, make sure you have a few extra up your sleeve! I did 4 humanities subjects and always did the sections in order. For some reason my brain couldn’t handle doing it out of order. My advice is to use your first assessments to see how you like to do the exam, so you aren’t experimenting in the HSC. The most important part of the exam is PLANNING. In the reading time, you should work backwards. Choose what essay question you’re going to do, read the business report situation and then quickly skim the short answer and multiple choice. If you have any spare time, go ahead and do a few multiple choice. As soon as the exam supervisor says start, immediately plan Section III and IV. Trust me this saves so much time in the end. Just like syllabus, past papers will become your other best friend. The term before my trial, I completed one Business Studies paper per week and submitted it for feedback. FYI, yes, I did complete 10 WHOLE 3-hour papers. You probably think I am crazy, and you are probably right. Also, collaboration is key! Don’t be scared to share your resources with others, because at the end of the day if everyone does well, it will lift your whole cohort’s marks. Don’t be scared to ask for feedback! I was lucky enough to have a teacher who always made himself available to give me feedback and answer my hundreds of questions. ‘Good inputs lead to good outputs’. Great. Very useful advice. Thanks.